Thank you for your interest in Our History Revealed: Africans in Modern America Grades 9-12 Volume 2! Please visit the Our History Revealed main page, if you have not done so already. Then, come back here to learn more about our Modern America program. If you are looking for Early American History please visit its page. Note: Early American History is available for Grades 1-6 only. 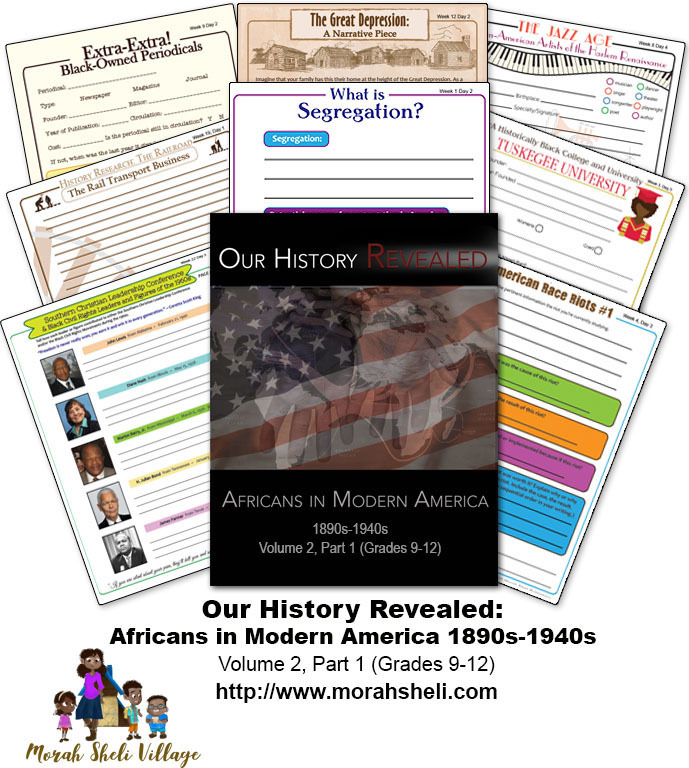 What is Our History Revealed Volume II, Part I: Africans in Modern America Grades 9-12? Our History Revealed: Africans in Modern America Grades 9-12 is a complete history program in American History from approximately 1890-2008. It includes daily history lessons, historical narratives, geography, research, writing, activities, and discussions. There is a student journal that pairs with this program. It is sold separately. Our History Revealed: Africans in Modern America Grades 9-12 Volume 2 is sold in two parts. There is not be a Hebrew version available in Year 2. To complete PART 1, 6 required books are necessary. There are additional books that are optional, but these titles help to provide a richer study of history. Our History Revealed: Africans in Modern America Grades 9-12 is designed for a four-day week. Each daily lesson is displayed in a one-page format with the nine features mentioned above. Parents/Teachers should begin daily with reading “The Heart of History” to familiarize themselves with the day’s history narrative and learn about any additional preparations. Visit the Morah Sheli Village Shop to purchase. Please note that Our History Revealed: Africans in Modern America Grades 9-12 is NOT a digital product. A physical, spiral-bound curriculum will be mailed via USPS. The History Scholar Journal Grades 9-12 is required for the course. A physical, spiral-bound journal will be mailed via USPS.